Normally, I’m a big fan of fireworks, but this year Greg and I just didn't feel like fighting through the crush of humanity to find a spot from which to watch them. Nonetheless, we wanted to celebrate the day. Greg finally came up with the brilliant idea to explore the Financial District while the bulk of the city was queuing up along the western edge of the island. It proved to be a very patriotic way to spend the Fourth. We wandered amongst some of the oldest architecture in country and visited the seat of American Capitalism -- and what’s more American than Capitalism? 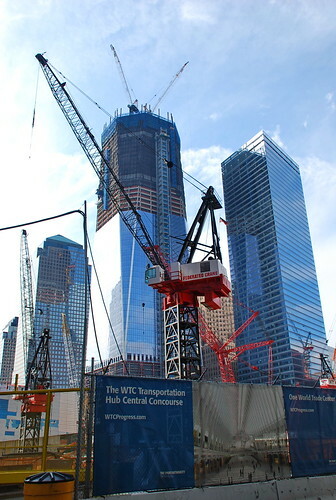 Most importantly, we took the opportunity to pay homage at the site of the World Trade Center. I’d been by the site a couple of times, but only in passing, and Greg had not had the chance to go by at all. This was perfect chance to visit and reflect. With the area emptied out of its weekday bustle, we were able to fully take in stateliness of the place. 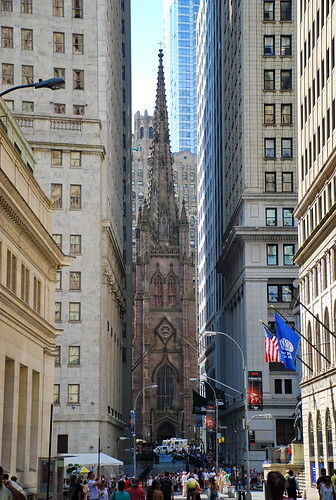 So many styles of architecture are represented here – Victorian, Georgian, Art Deco, and tall, glass skyscrapers all mixing together. 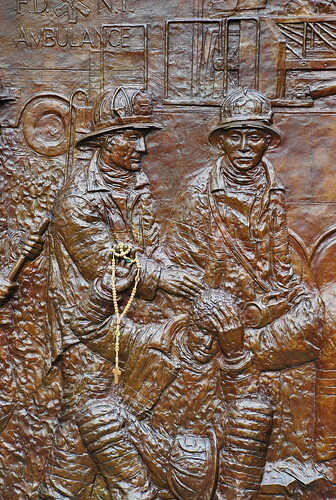 And for more, you can see my pics of our walk on Flickr. 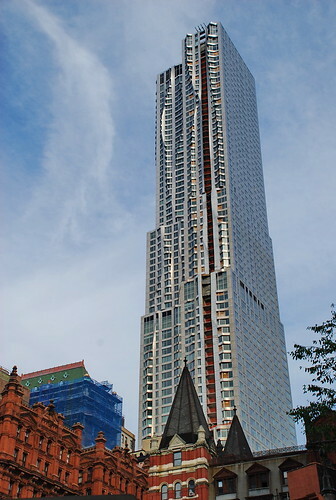 Bringing things up to date is Frank Gehry’s uber-modern building at 8 Spruce Street, which now towers over the area. The one negative to visiting while the place was empty was that a lot of the restaurants and shops were closed for the Holiday or had reduced hours. We got lucky on one important count though. 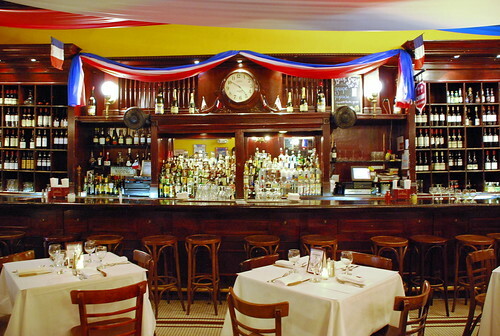 When our original plans feel through, Greg came up with the idea to visit Les Halles – home base of Anthony Bourdain, of whom I’m a huge fan – and they were open. The hostess looked extremely confused for a brief moment when we walked in at 4 p.m. on an otherwise dead Holiday afternoon. Since we were one of only a few customers, we got a table right away and enjoyed prompt service throughout the meal. 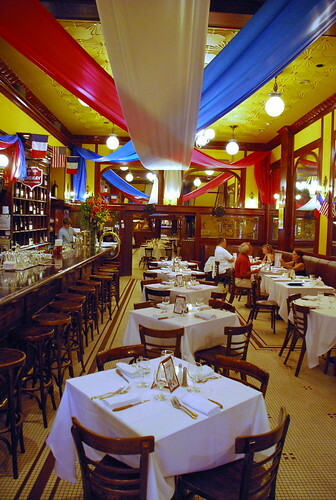 The restaurant was decorated in red, white, and blue banners and American and French flags were hung throughout; so it worked out that we got celebrate Independence Day and an early Bastille Day, all in one fell swoop. Greg and I decided to share two appetizers and an entrée, accompanied by a couple of beers. 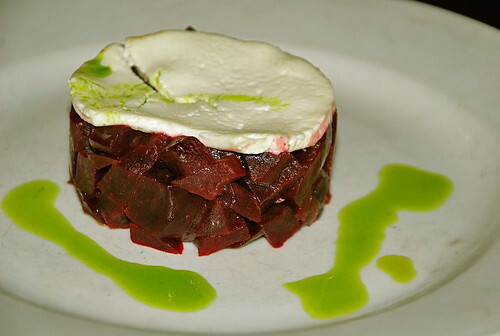 We began the meal on the lighter side with a roasted beet salad toped with goat cheese. While the beets were good, this place seems to shine with the French classics, and that is what it’s famous for after all. 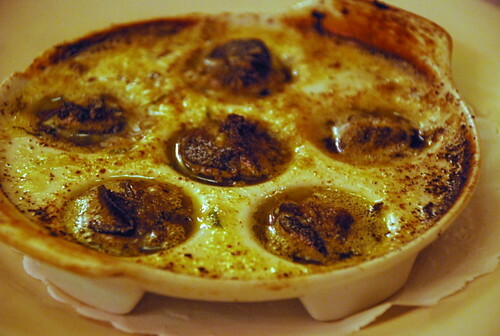 Our meal continued with the escargots and they which were everything they should be – plump, meaty and bubbling in garlic butter. There was not one grainy bite in the lot. Of course, we could not let the leftover garlic butter go to waste, so we put our bread basket to good use and sopped it up. I'm getting hungry all over again looking at this pic. 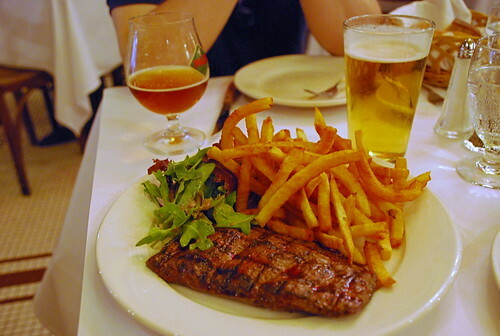 For our entrée we split their Steak, Frites, and Salade. We ordered our steak medium-rare and it was right on the money. It was perfectly pink, just past rare on the inside, lightly charred on top, tender, juicy, and extremely flavorful. The fries were golden and crispy. With everything so expertly prepared, it’s clear why this combo is such a beloved classic. All in all, a very satisfying Linner - or maybe you prefer Dunch-- and a very Happy 4th of July! Our meal was very reasonably priced, but both Les Halles locations are advertising a slew of upcoming deals. The Downtown location will be participating in Restaurant Week, July 11-24, and they will additionally be continuing to celebrate Fourth of July and Bastille Day with Liberty Festival dishes. Both locations also have Monday night wine deals and specials on regional dishes every other week from Monday to Wednesday. Additionally, they will be participating in the Bastille Day festival on 60th Street between 5th and Lexington on July 10th. It looks like a great time, but we’ll sadly be missing it as we’ll be out of town. I’d love to hear highlights, so that I know what to look forward to next year. Century 21 – If you can deal with the huge crowds that are perpetually combing the endless wracks of clothes, this is a great place for designer deals. What else do you like in the area? 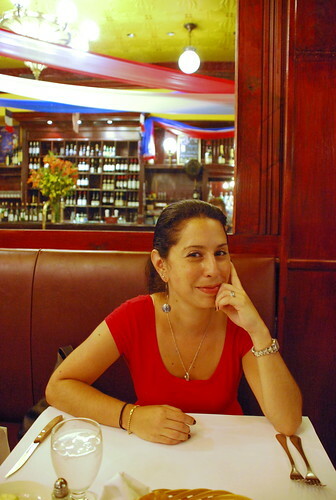 Any favorite coffee shops or particularly delicious weekday lunch stops?